As one commentator mentioned “It is a wacky world of Marion she lives in”. I would say Marion has been living in Dr. Walter’s wacky world for the last many years. As a six year old you start following what your dad and coach tell you. Marion’s dash, in disbelief, to hug her father after her victory at Wimbledon, did not look any different than a six-year-old running into her father’s arms. For many years, tennis spectators at different tournaments’ practice courts could not resist laughing at Dr. Walters ways of training his daughter. Looking at the straps, springs and thick rubber bands that he utilized, many of the kids in presence of such methods decided never to chance an encounter with this wacky sport. If I ever wanted to deter my children from becoming tennis players, I would have shown them Bartoli’s intense training regime. It never looked fun. Fun to watch… maybe? People would argue that Bartoli won a Grand Slam Title only after she parted with her father as a coach. The fact remains that he laid the foundation for the hard work and work ethic that Marion followed through her life and career for close to twenty years. She came very close to winning Wimbledon Championship in 2007, when he was still her coach. It was also good to watch the usually fidgety Dr. Walters sitting calm; clapping, enjoying and witnessing the first grand slam win of Marion. (He used to be so tense that Marion once publicly ordered him to leave the courts.) – The relationship has been widely talked about in tennis circles. Well, people can talk, argue, laugh or whatever they like and the commentary may go on for some time at least. However, Dr. Walter and his daughter Marion deserve all the respect in the world of sport for achieving the success through self-belief and sheer hard work. Good for Dr. Walters and good for Marion. There is definitely more than one way to skin a cat. It would make more sense if Serena’s last name was Willpower instead of Williams. How many titles and matches has she won because of her self-belief and will power? Not to say by any imagination, that she is less talented or lacks skill. Although Azeranka gave everything she had and put up a good show, it always seemed like a fighting show rather than a winning show. Hopes were raised when Vika started serving for the US Open title, but were very short-lived for her fans. 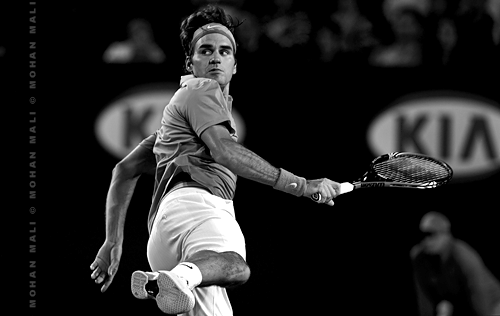 Federer’s on court movements have been compared to ballet by many. If Novak Djokovic was huffing and puffing on Friday, Andy Murray was seen tumbling down on his head, in a yoga like pose on Sunday. While this was going on, a guy named Roger Federer from Switzerland, was performing a superb ballet, on a grass turf across the net. Murray was made to deal with 34 different spins, 57 different bounces, 147 different lengths and speeds of a tennis ball in one single tennis match. The variety and ferocity was simply too much for Murray to handle. The final produced some of the best grass court tennis. My heart goes out to Murray, who cares so much for the sport of tennis. Murray tried everything that was legal and available to him. He was very emotional but gracious and generous to his fans and Federer, in the post match interview. Jim Courier once commented, if you want to beat Federer; just make him play some mundane tennis, like… forehand to forehand rallies and simply bore him. Do not challenge him with your skills. Murray was not listening and decided to break Federer in his very first service game of the match. That is a bit too soon to stir up and wake up the genius in a guy like Federer. At times in the past, Federer has been guilty of leaving it too late to bring his A game to the court. This time Murray took care of that problem, for Federer. This is one time I enjoyed being proven wrong. Considering the way Federer has played against Djokovic and Nadal in the recent past, I had given Federer no chance of coming through the semifinals of this Wimbledon. I was expecting Djokovic to defeat Federer in 4 close sets. On the contrary, what millions of tennis fans watched world over on Friday, was vintage Federer at his best. Silent and calm Federer, had Djokovic, the present world No 1; huffing, puffing and grunting at the other end. Apart from some time in the second set, where balls started flying past Federer’s forehand. But in the end Federer served for the match and prevailed, under the roof at Wimbledon. The reason I did not choose Federer over Djokovic is, in my opinion guys like Nadal and Djokovic are prepared to get dirty on a tennis court. On the other hand Federer makes sure the number of strands of hair, over his Nike head band are the same, after every long rally. Except Mirka, no one knows how much time Federer spends in front of the mirror every day. The man is all about style and even more about substance. Federer plays Murray on Sunday in The Wimbledon final. Once bitten, I am staying away from making predictions again. Instead, I am looking forward to watching Federer, the poetry in motion (not my superlative) against Murray, the counter-puncher (again not my description) in the Wimbledon Final on Sunday. Good luck to everyone. Five months ago, after losing to Nadal at The Australian Open final in Melbourne, Federer would have liked to rush to the locker room, have a cold shower and hide his emotions from the rest of the world. Emotions of frustration, disappointment, failure and anger. Throughout the match the raindrops refrained from playing the spoilsport, while history was being made. Towards the end they slowly started to come down becoming part of it. The missing crown in his kingdom was conquered, mission accomplished, dream of his life fulfilled. However you may summerise it, Federer was at peace with himself. For Federer the Nirvana was achieved, at least in that moment. From the beginning it was Federer who took charge of the proceedings at Roland Garros on Sunday and controlled them all the way. Federer entered the stadium with a refreshing smile and walked up to the net for the coin toss with confidence in his stride. Soderling looked a bit lost and avoided eye contact with Federer. Obviously this was his first Grand Slam Final. First Set : Soderling loses the first game on a double fault, it was him who was under pressure and not Federer. With pin point serving accuracy from Federer, the first set was done and dusted in 23 minutes at 6-1 and Mirka was already smiling away. Second Set : Although Federer started the second set on a double fault, his serving throughout the match was so accurate that Soderling was left scratching his head literally after one of the aces that Federer hit. An intruder on the court as Federer led at 2-1 and Solderling serving at 15-0 did distract Federer. Visibly shaken Federer lost the game to love. (Soderling did keep his cool though and to his credit did not lose his concentration). For a second, Federer must have thought it was Nadal in disguise with a spanish flag. When it passed as a bad dream, awoken from his sleep with relief, Federer looked more confident. Federer, more focussed and Soderling starting to find his groove, we were headed for a tiebreaker. 6 all. To Soderling’s misfortune Federer served 4 aces and sealed the tiebreaker and the third set 7-6(7-1). Third set: It was a day when Soderling had to go for lines, missing them by a small margin. On the other hand and other end at 4-3 Federer was finding the lines on both flanks with amazing ease which he would normally miss. With a break ahead and serving at 5-3, there was no doubt that Federer was on his way to his 1st French Open and 14th Grand Slam Title. A wild backhand and an easy miss on a volley sent Federer fans into a fluttering frenzy, and Mirka clasped her hands in agony. Luckily Soderling’s resistance was over by then and he put the return on Federer’s serve into the net. The history was created at Roland Garros. Federer went down on his knees and cried out loud with emotions as the crowd applauded and chanted. Federer was already smiling and talking to the TV presenter on his accomplishment. For the record, Federer served 16 Aces. Knowing Federer the state of Nirvana will be momentary for him and the peace that he has achieved is not going to last much longer. After winning the French Open for the first time and equalling Pete Sampras’s record of 14 Grand Slams, Federer’s craving for more success will be growing. He will have new ambitions, obsessions and fixations as he will set new goals for his carreer. He has made it public that he would like to be remembered as a legend of the game and would like to play as long as he can. He would actually start playing more free now that the pressure is gone from his shoulders. Tennis fans, especially Federer’s, will have more to look forward to, apart from the frustration in coming years. If you are a Federer fan and follow his progress passionately, of late for the last two weeks that is, frustration could be part of your life (and if you’re wondering about that sore neck, it’s probably from throwing your head back in disbelief repeatedly during his five set marathons that you watched live). This is followed by a sigh of relief when he gets through those matches at The French Open. Federer’s progress through the tournament has been far from convincing. Having said that, all the other potential winners of this Grand Slam like Nadal, Djokovic and Murray have already bitten the red clay in the tournament. Therefore the guy deserves some credit for hanging in there and coming through two five setters. Acasuso, Mathieu and Haas all pushed him to the brink of defeat, except Monfils who was dismissed in straight sets. They achieved it by going at Federer earlier in the match and attacking him. Surely, Soderling will be well aware of this and will have his assault plan ready for the final on Sunday. So . . . with the early demise of the Mens’ tennis top brass, it has all gotten very interesting for the mens’ final in Paris. Federer will have to get his act together for the final and take charge of the match earlier than later. He will also have to make it amply clear from the word go that he wants this badly and nothing can stop him from reaching his dream of equalling Pete Sampras’s record. If he decides to camp on the baseline and see if Soderling is willing to hand it to him on a silver platter, my guess is he would be left dreaming. Soderling on the other hand has nothing to lose and can be very dangerous, if allowed to play his tennis; that is bashing the tennis ball flat on both wings with a lot of venom that takes time away from his opponents. Not to mention the flat serve that gets delivered from close to 11ft above the ground. Soderling is also good at keeping the ball deep which can prevent Federer form attacking. Federer has some of the most amazing weapons up his sleeve to pull this through. His serve is the most underrated in the world of tennis and has rescued him in difficult situations in the past on more than one occasion. 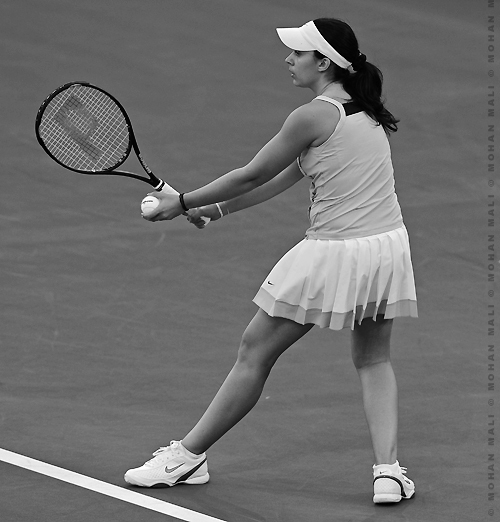 Fed also combines it with follow up play by placing the ball in the right place than concentrating on sheer speed. Playing against Haas, Federer did not lose a single point on his serve in the first set. The drop shot can be deadly and very useful against Soderling if he can execute it with Swiss precision. So obviously there are many ifs and buts. But Federer seems to go through patches of passive thinking through his matches and tends to switch off. In his defense though he has learnt to back off a bit and paces himself through the match. However being the artiste that he is, he gets nervous. (All artists do, machines don’t). With the tennis talent and experience that Federer possesses there is only one person standing between him and his 14th Grand Slam. It’s not Soderling, but Fed himself.